FCC Enforces Against Owner of a Well Pump - Miata Turbo Forum - Boost cars, acquire cats. Ahh, the Federal Communications Commission- my old nemesis. 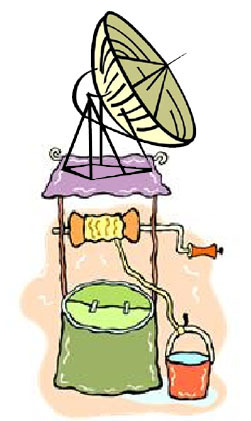 The FCC has cited the owner of a “well pump” for causing harmful interference to radio communications. Wait – a well pump? A machine that brings up water from a well? What makes the FCC think it has jurisdiction over pumps? Next, they’ll be regulating the bathroom fixtures. The truth is, some of the greatest interference threats to radio communications come not from radio equipment, but from electrical devices such as elevator motors, photocopy machines, vehicle ignitions, and even fluorescent lighting. The FCC closely regulates radio transmitters and digital devices to limit the interference they can cause. You would think the FCC would also regulate the more important sources of interference. It turns out they do. Just not very often. of interest here, “incidental radiators,” which generate and emit radio-frequency energy, although not intended to do either – such as the examples listed above. This last category is subject to two FCC rules. One requires manufacturers to use “good engineering practices” to minimize the risk of causing harmful interference to radio communications. This rule is widely ignored. The other rule says that operation of any unlicensed device, including an incidental radiator, may not cause harmful interference to an authorized radio service. As to incidental radiators, this rule is also widely ignored. Just ask Ruben D. Lopez, Jr. of Pomona Park, FL, who ignored it at his peril. Mr. Lopez owns the above-mentioned well pump, whose operation caused harmful interference to an authorized radio service. Those versed in these matters will deduce immediately which authorized radio service complained of interference. We know of only one service whose users have the spare time and energy to track down a hapless well pump owner and pursue him through the FCC enforcement process. That would be the Amateur Radio Service, at least one of whose operators encountered interference at 1800 kHz, in the amateurs’ 160 meter band, and ratted him out to the FCC. The FCC sent Mr. Lopez a couple of letters suggesting he install A/C line filters on the pump. Depending on how much power the pump draws and the severity of the interference, a suitable filter might cost anywhere from a few tens of dollars to a thousand dollars or more. The record does not show whether Mr. Lopez ignored the FCC’s advice or the filters were unsuccessful – only that the interference reports persisted. No doubt with a heavy sigh, the FCC sent out field agents with direction-finding equipment that duly homed in on Mr. Lopez’s pump. The agents confirmed the pump was the source of interference by turning it on and off. The spectrum is a busy and crowded environment. Interference is a fact of life. Certainly the amateur radio community has a legal right to interference protection from well pumps and other non-radio equipment. Unlike cell phone users, however, or pilots depending on navigation aids to land airplanes, amateur operators near an interference source can easily change frequencies, or even bands, if necessary, to avoid the problem. We would think that takes a lot less effort than calling in the spectrum gendarmerie. To be sure, people who cause interference deliberately, or who knowingly use noncompliant or overpowered equipment, are not entitled leniency. We also think the electric utilities, due to the ubiquity of their lines, have a special responsibility to control interference arising from their installations. TL;DNR: HAM radio operators need to get a life?